Founded in 2007 by a group of passionate young musicians led by viola da gamba player Amit Tiefenbrunn, the Barrocade ensemble is now one of the most outstanding ensembles on the Israeli musical scene. Barrocade has been appearing in all the major concert halls in Israel, among them the prestigious Tel-Aviv Museum, where it gave a series of concerts. It also participated in all of Israel’s major festivals, including the Israel Festival. Lead violinist Shlomit Sivan is the group’s general manager. The ensemble members, all graduates of leading European academies, specialize in early music, and play period instruments. The ensemble’s string instruments were built by its music director Amit Tiefenbrunn, and the bows by lute player Eitan Hoffer. Some of Israel’s best musicians play with the ensemble. Among them are Shai Kribus, Yigal Kaminka, and Ofer Frenkel, who take part in the performances, sharing their time between Israel and Europe. Barrocade normally plays without a conductor, after the custom of the Baroque era, but collaborates with international conductors in performing large Baroque pieces such as oratorios and operas. The ensemble is famous for its rich sound that is owed to its large and varied basso continuo section. Over the years, Barrocade has collaborated with many international musicians. Among them were conductors Philip Picket, David Stern, Matthew Halls and Shalev Ad-El; violinists Patrick Cohen-Akenine and Kati Debretzeni; and singers Marten Engeltjes, Marek Rzebka, Markus Ullmann and Robert Sellier. 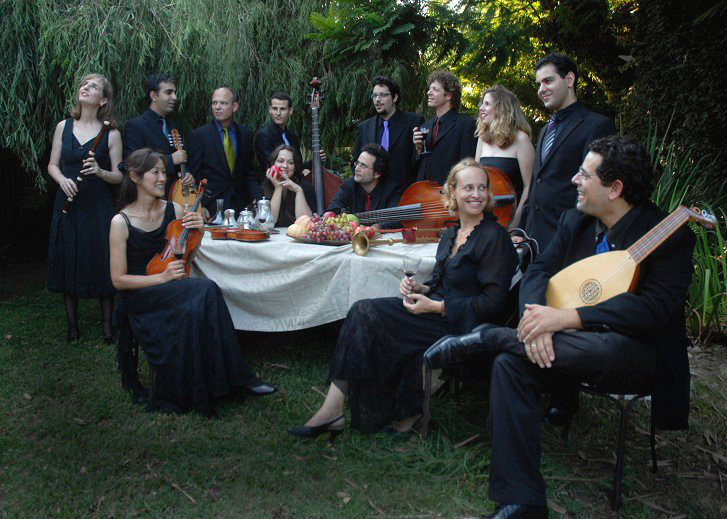 In 2011, the instrumental ensemble was joined by Barrocade Vocale, a group of 5-8 singers founded by Ye’ela Avital and Yizhar Karshon. The singers now take part in Barrocade’s different projects, from Monteverdi madrigals to Bach cantatas and Handel operas. Barrocade appeared in the Varaždin Baroque Evenings Festival in Croatia, and was granted the Prize of the Excelling Concert. It has also represented Israel in concerts in Florida, USA, and in Tbilisi, Georgia. It participated in the performance of Purcell’s semi-opera The Fairy Queen in Israel and in London’s Wigmore Hall, in collaboration with the British Ensemble Retrospect. Music director of Barrocade, plays the viola da gamba and the violone, and builds musical instruments. Tiefenbrunn began his double-bass studies in Israel with Eli Magen, and continued his musical education at the Utrecht School of the Arts (HKU), where he studied the viola da gamba with A. Pols. He also studied the violone, and specialized in chamber music with M. Urquhart at the Royal Conservatorium of music in Hague. Tiefenbrunn has also pursued a solo career. In the past, he was a member of the Aeole Trio of Berlin, with which he recorded two CD’s. While he was studying music, Tiefenbrunn specialized in the art of building period instruments under D. J. Hamoen. Since then he has been building viols, violins, harps and other string instruments for Barrocade and for many other players in Israel and worldwide. In addition to his work as Barrocade’s music director, Tiefenbrunn also plays with various other ensembles, and has recorded several CD’s with them. He participates regularly in leading classic and baroque music festivals, and in a variety of radio and television programs in Israel and around the world. He teaches viola da gamba at the Rubin Music Academy in Jerusalem. Barrocade | Powered by Mantra & WordPress.